It was a #LikeALocal prompt from the peeps at GoEuro that reminded me that I had never done a city guide for my own hometown. So what would I recommend for visitors to Birmingham with a weekend to play with? If you’ve arrived on a Friday and are ready for a drink or two and a bite to eat, look no further than Digbeth Dining Club. It’s about a 10 minute walk from the city centre, even less if you’re arriving in Brum by National Express Coach. If you’re venturing into Digbeth then you may as well start off at The Old Crown, a 640-something year old pub with olde-world charm, and a great big beer garden. As tempting as the menu is, move practically next door to the two or three units and covered courtyard which make up Digbeth Dining Club. There’s a rotating guest list of some of the Midland’s best street food vendors, and it’s highly likely you’ll find something to please everyone. Dishes are usually around £6-£8 each and there are three bars, including a specialist gin and cocktail bar hidden upstairs at Mama Roux’s. My personal DDC favourites are Buddha Belly, The English Indian and Kebab Cartel, with sugar cravings satisfied by The Bournville Waffle Company. Birmingham’s iconic Custard Factory is just around the corner, with its distinctive street art and independent stores. If you’re after good beer sold by those in the know, pop into Clink, a great little bottle shop and bar for those passionate about their beer. Or if you fancy watching a movie, check out Mockingbird, a bar/restaurant/cinema combo. Finally. if you’ve got the urge to dance, check out Night Owl; it’s primarily a Northern Soul club but has regular club nights for disco, funk, soul, 60s and alternative fans. For a great breakfast or brunch, make your way towards Ju Ju’s Cafe on Browning Street. Full English (meat or veggie)? Hash served in a skillet? Eggs Benedict? The ubiquitous Avocado Smash? You can find them all, and they’re all equally tasty. It’s a great canalside cafe and everyone – locals or newbies – get the same warm welcome. To walk off that breakfast, you can now take a walk along the canal. Did you know that Birmingham has more canals than Venice? Brummies will share this fact with you at every opportunity. If you pop up at Brindley Place, you could pay a visit to the fishies at Birmingham’s Sea Life Centre, or if you fancy a bit of culture, there’s always the Ikon Gallery on Oozells Square with its every-changing contemporary and modern exhibitions. Back canalside, and you can walk down the Birmingham City Centre Path to the Mailbox. This is the former Royal Mail sorting office, now a entertainment and high-end retail complex. If you fancy a quick window shop at Harvey Nicks then this is your chance. There’s also numerous bars and restaurants here if the sun is over the yardarm and you fancy a quick drink – Gas Street Social is one of my favourites and a welcome break from some of the chains that have taken up residency here. If you arrived in Brum by train then you may well have already come through Grand Central, the shopping centre which sits above Birmingham New Street. Its worth a pass through just to see the transparent armadillo which forms the glass roof and makes the atrium bright, light and airy. You can walk all the way from Grand Central to Birmingham’s famous Bull Ring without going outside by following Link Street – passing the ridiculously hip Cereal Killer Cafe if you fancy some Lucky Charms for your lunch (Alas, as of January 2018, Cereal Killer Cafe in Brum is no more.) You can find all the major chains in the Bull Ring, but make sure you pop outside and see the Bull – have you really been to Brum if you haven’t posed for a selfie with the Bull? And whilst you’re outside, check out the controversial/much-loved (delete as appropriate) Selfridges building with its silver mirrored discs on a blue background. We like a bit of quirky architecture here in Brum (check out the wedding cake shaped Library of Birmingham too for further “what-were-they-thinking” buildings). If you fancy a stroll over to the Eastside of the city centre, you’ll find the Thinktank Science Museum, and an urban park which provides a peaceful haven away from the hustle and bustle. It’s close to a number of the city’s colleges and universities and it also provides a gateway down to the creative and independent hub of Digbeth so there’s often something going on in this area that even locals tend to overlook. If you’re lucky to arrive on one of Birmingham’s Hidden Spaces open weekends you may even be able to look inside the historic Curzon Street Station building – the oldest surviving railway terminal in the world – before it’s utilised as a hub for HS2. Make sure you pop into The Woodman for a quick drink, another beautiful Victorian building restored into a traditional real ale pub. Depending on where you’re staying, make sure you pop by Tilt on the way back for coffee, cake and the chance to spend all your hard-earned pound coins on pinball. There’s also a rotating beer menu, and the staff – like those at Clink – know their stuff and are happy to make recommendations. By day, Birmingham’s Jewellery Quarter is a shopping and manufacturing hub, by night its the perfect bar crawl destination with lots of food options along the way. If it’s a sunny evening, start off at The Lord Clifden, with it’s huge beer garden. It gets a bit rowdy on some evenings but if that’s what you’re after then feel free to disregard the rest of this guide. Or amble down Great Hampton Street to The Church for a rooftop terrace, great cocktails and a Louisiana-inspired soul food menu. It’s back into the heart of the Jewellery Quarter and its iconic clock for the Rose Villa Tavern, a traditional pub with beautiful stained glass windows and a red phone booth. More cocktail options and a good selection of beers available, as expected from one of the city’s Bitter ‘n’ Twisted venues. The Button Factory also has a rooftop terrace for soaking up the sunshine, and it’s just a short walk from here to my personal JQ favourite 1000 Trades. Independent, craft beer, natural wines, rotating kitchen pop-ups and a showcase for the city’s artists and tradespeople; you never get the same experience twice at this bar. And their Sunday Jazz Roasts are pretty special too if you get the opportunity to revisit. If you’re feeling a bit bleary-eyed after the night before, it’s time to get out of the city. It’s a 20 minute taxi ride or a jump on the No 50 bus to Kings Heath for a spot of breakfast at Cherry Reds or Kitchen Garden Cafe, both on York Road, next to the Grade II Listed pub and music venue Hare & Hounds. There’s a second Cherry Reds in Birmingham on John Bright Street in you can’t face a bus ride. If you want a bit of fresh air and greenery to blow the cobwebs away, Cannon Hill Park is is also south of the city, with mini golf, pedalos and tennis courts if you fancy getting a bit energetic. It’s also home to the MAC Arts complex, with it’s programme of dance, theatre, music and education; you can check what’s going on at the MAC here, or just pop into the cafe for a brew. Cannon Hill is also home to Birmingham’s Wildlife Conservation Park if you want to talk to the animals. It’s a bargain £6.25 for adults and they specialise in the conservation of endangered species. If the MAC has given you the taste for culture, it’s back into the city for the Birmingham Museum and Art Gallery. Granted the whole area around BMAG is something of a building site at the moment whilst “Paradise” is being constructed (don’t laugh, that’s what the new office and leisure complex will be called) but you can while away a couple of hours on a Sunday roaming among the Pre-Raphaelites, the Staffordshire hoard and Ancient Egyptian artefacts. If you’ve got a couple of hours to spare before heading out of Birmingham, you might want to catch a film at the Electric Cinema – the oldest working cinema in the UK. Don’t let that put you off though, it shows both the most recent films and classics, and has sofas, a bar and waiter service. And that brings the curtain down on a weekend in Birmingham. If you really want to live like a local, get yourself an Independent Birmingham card which will give you discounts at loads of Brum’s best independent bars, restaurants and shops! All venues have been tried and tested by yours truly and are all highly recommended. I have no professional affiliation with any of the venues mentioned. 2018 Update: Did you know you can now download this city guide through the GPSmyCity app on iOS and Android? For GPS-assisted travel directions to the attractions featured in this article, and other related city walks and tour guides, search for “Birmingham”, or you can find all the Birmingham content here! "Forty is the new Thirty…"
"Restaurant Review: Tom's Kitchen Birmingham"
You make Brum look so pretty!! …there’s no mention of the recent bin strike!! Oh noooo! What are they striking about? I hope it didn’t get too stinky! Em, you and photographer make a great team. Hopefully we will visit Brummie land next year on our way up to North Yorkshire, as your post has made the city look very interesting! This is awesome! 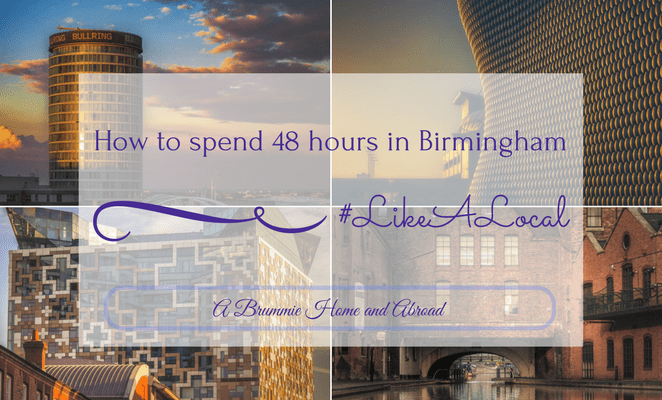 Until I met you and Suzie online I never knew anything about Birmingham. We’re the new Birmingham tourist board! I was thinking that maybe a quiet word in someone’s ear at the Tourism centre to get recognition! Extremely well written and full of helpful tips. Thank you!